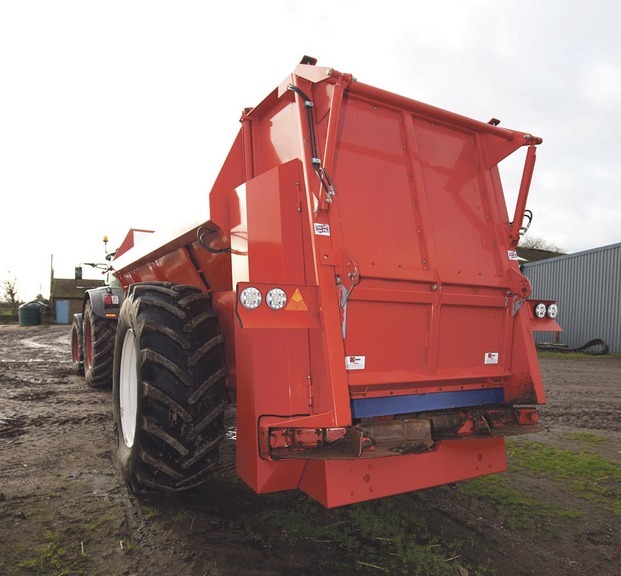 Looking to spread muck more accurately and efficiently, one Shropshire farm has turned to K Two’s Bio model muck spreader equipped with weigh cells. Geoff Ashcroft reports. Alex Pike says the weigh cell spreader takes the guess work out of muck spreading. 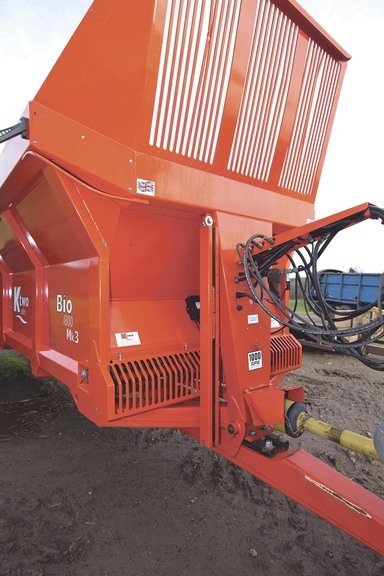 Spreading about 15,000 tonnes of chicken muck each year for its own needs and as part of a contract spreading operation for customers, Shropshire farming firm J A and O Griffiths, of Ellerdine Grange Farm, has recently improved application accuracy. With the farm’s muck spreading tasks extending from spreading on grassland, stubbles and running down tramlines - the latter considered a useful top dressing role in spring - an element of greater traceability was deemed necessary. And the ability to determine and control application rates independently of forward speed, while creating a spread pattern that could suit tramlines, was considered the way forward. The 18-tonne spreader handles around 15,000 tonnes of manure each season. Kit for the task includes a K Two Bio 1800 rear discharge spreader, equipped with on-board weighing and an automatic rate controller. Bought three years ago to replace a five-year old K Two spreader that was returned to the manufacturer for refurbishment, Mr Pike says the farm has never looked back. The K Two Bio combines an RDS 8000i controller and four weigh cells – two on the drawbar, two above the rear axle, recessed into the spreader chassis. This design suspends the body in a way that avoids any additional subframe construction. It also means the spreader’s overall height remains unchanged. With muck analysis providing the basis for nitrogen values, the operator can enter the spreading width and desired application rate into the control box. The spreader then automatically regulates bed speed, according to forward speed, to achieve the required rate. “If we travel too fast while spreading, and the system can’t keep up, we get a warning on the control box to slow down,” he says. A front-mounted sight gauge indicates slurry door position. 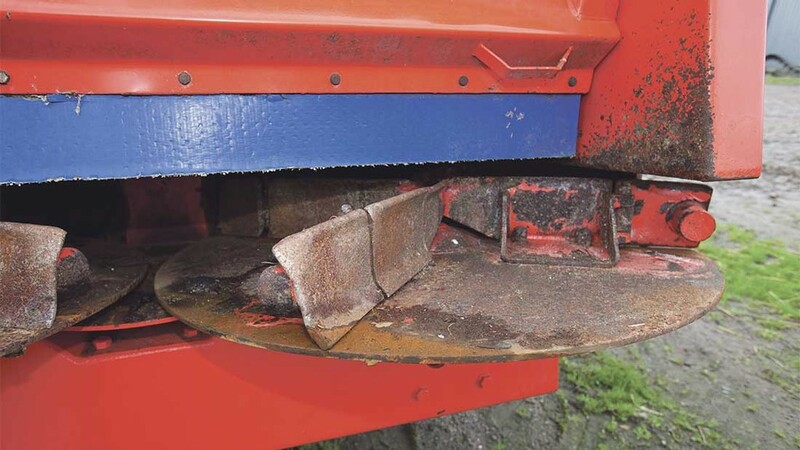 Mr Pike says the spreader’s weigh cells are checked and calibrated each season using the farm’s weighbridge, adding that the spreader is accurate to within 2 per cent. Power for the spreader comes from a Fendt 936 Vario equipped with RTK and steering guidance, but the farm has also used the machine behind its Challenger MT765C. Mr Pike’s experience of using K Two spreaders has led to technical improvements in a couple of key areas. One is the addition of hinged vanes on the spinning discs. He says stones can cause issues with fixed vanes - if trapped, they will be slammed against the outer frame of the disc bed, leading to a bent vane and the potential to warp the spinning discs. Spinning discs get hinged vanes to reduce damage from any foreign objects. The other area of improvement is the use of a mechenical indicator for the rear slurry door setting. The wire rope operated gauge is located on the front of the spreader, by the drawbar, and gives a quick visual reference of how far the door has been raised. Despite the occasional electronic gremlin - the farm often leaves a few kg in the spreader rather than emptying it fully each time to help stabilise the rate controller. Previous: Is AHDB meeting the needs of its levy payers?